Freya and Ross first noticed something was wrong with their daughter Harmonie-Rose when one evening they heard her coughing and it sounded like she couldn’t breathe. Harmonie-Rose was taken to the Royal United Hospital in Bath, but then seemed a little better. She was sent home, but the following morning her lips started to go blue and she was having convulsions. Doctors at the A & E department took her temperature and checked for a rash, but they couldn’t find one so instead, Freya and Ross were sent home and given a pass to go straight to the children’s ward if Harmonie-Rose appeared ill again. It was during Sunday lunch that Harmonie-Rose began to cry, became floppy and very lethargic. She was taken straight hospital and rushed into the adult intensive care section. Harmonie-Rose needed to be taken to the children’s hospital in Bristol. At the RUH intensive care, they could not stabilise her. They didn’t know if she would survive the journey, but they had to risk the journey. Freya and Ross were advised not to go in the ambulance so, followed in their car. When they arrived at Bristol, Harmonie-Rose’s legs and arms had turned black. Consultants at the hospital said it was one of the worst rashes they had seen. The first day Harmonie-Rose was in hospital consultants gave her a 10 per cent chance of survival. As the days passed the hope she would survive increased. Harmonie-Rose fought hard and survived. However, due to damage done by the meningitis, Harmonie-Rose had to have a quadruple amputation of her limbs. “Harmonie is our little miracle, and fought so hard to stay here with her family. Life for Harmonie will be very different and our whole community are working very hard to provide her with the life she fought so hard to have. Harmonie has come on leaps and bounds since losing her arms and legs to meningitis in 2014. She is 2 years old now, she goes to a mainstream nursery and has lots of friends, she shuffles about on her bottom… She is a very determined girl and full of character, the smile on her face is priceless. She is now on her 3rd pair of prosthetic legs which are provided by the NHS. She is learning to stand with them, she does not feel confident enough just yet to stand unaided, she has a standing frame, and will be trying out a walking frame at the end of this month. She has to have physio every day carried out by myself to help her posture as at the moment she is very flex when standing so we have a series of stretches to help her. She loves to paint and draw, she loves reading and singing as well as completing puzzles and can also feed herself with an adapted spoon. Harmonie visits the NHS prosthetic centre every 4 weeks to check how she is doing on her legs and whether she is having another growth spurt because when she grows she needs new legs to fit. We have finally got some chronic wounds on her legs healed, which has enabled us to take Harmonie swimming and partake in hydrotherapy. At the end of last year Harmonie picked up her wizzy bug which is an electric wheelchair which she is learning to control herself it enables her to have a bit more independence outside when we are out and about and gives her a break from working so hard to get about. She is beginning to try and stand up while leaning on things which is great, being a through knee amputee she is able to stand up and put pressure on the end of her legs, this is a huge step and shows the stretches and physio has helped dramatically. When Harmonie became ill my older sister Hannah decided to fundraise for Harmonie after speaking to a parent who has a daughter who lost both arms and legs to meningitis. The mother of this other child explained that as Harmonie is a quadruple amputee her balance is obviously a lot harder and she may struggle to use the NHS prosthetic as her daughter does, She also warned us that everything to enable Harmonie’s independence is going to cost money, for example things like an adapted toilet and a push bike all cost money, she then explained that she is struggling to fundraise for her daughter, so her advice was to start as soon as we could if we felt strong enough. We signed up with Tree of Hope. Hannah came up with the idea of making bows and selling them and asking people to put them up outside their houses or on their bags or to just wear one, so that people could show that they are hoping for Harmonie and from this moment the campaign really set off. The bows were in such high demand, this was when Harmonie was in hospital having her amputations and was still very unwell, my head was all over the place so when going back home to collect some bits was heart-warming to see all these bows it made us feel like we were not the only ones and that we were not alone. Our local paper then got behind us, then some national papers, and our local BBC and ITV news channels as well as a few times being featured in the national news. We also have a facebook page which helps us spread the word about Harmonie and have followers so they can follow her progress and donate if they wish to. 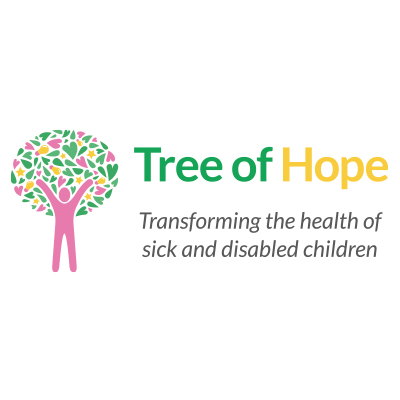 Tree of Hope have enabled us to have an easy way to donate online or through text, being part of a registered charity has meant that companies wanting to help Harmonie and contribute to her future can do so, and being part of a registered charity enabled us to be able to do bag packing at Sainsburys and allowed us to carry out street collections. Being with Tree of Hope has also meant we have a safe and secure place to put Harmonies money until we need it. Sadly we do not know what the future will hold for Harmonie, at some point she will need a bedroom which is accessible and a toilet which enables her to be independent. We are not sure how Harmonie will progress on the legs from the NHS as they are basic models, so may well soon need to start going private and legs are very expensive. 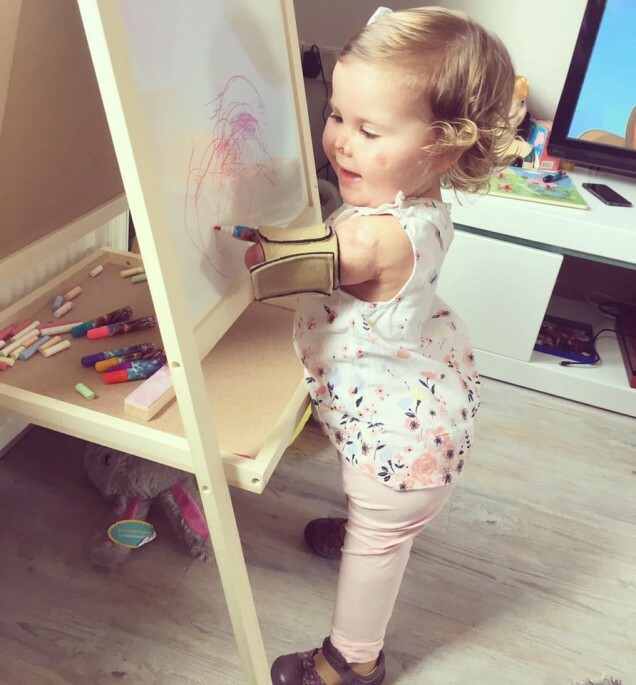 Hopefully one day she may be able to have a bionic hand. In other words, we are not sure how much or what Harmonie will need through her life. We fundraise because we want to be prepared and ready for anything she will need to have a life like any other child. We are currently using Harmonie’s Tree of Hope funds for additional hydrotherapy which will help her massively, and we will need to continue this. Our fundraising will continue, so she Harmonie be as independent as possible. If we can support you like we have supported Harmonie please call us on 01892 535525 today to talk with our families team – Jenny or Georgie.